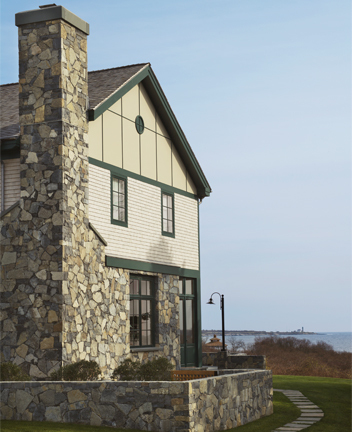 On a bluff overlooking Naragansett Bay, this guest house was designed as part of a family compound, on a site with little buildable area. 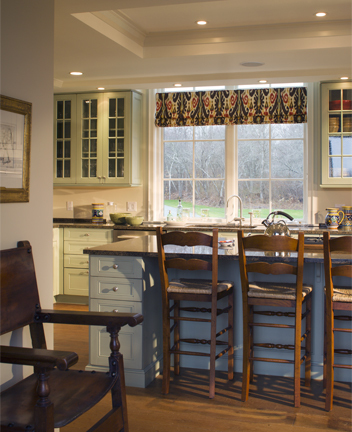 The existing elements (owner’s home, historic farmhouse and barn) were all designed and built at different times and in various styles. 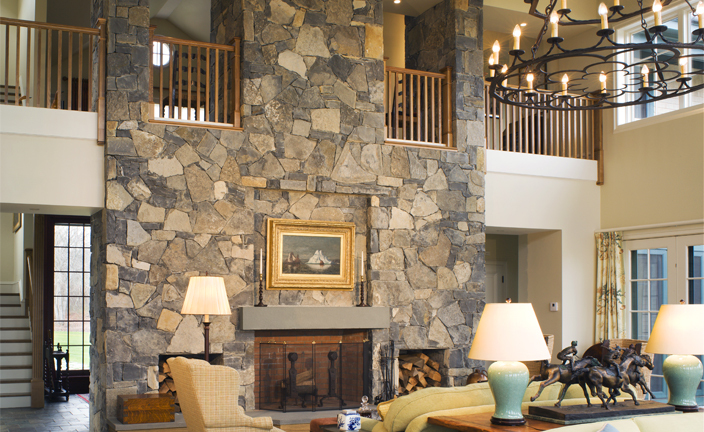 The owner requested that the new four-bedroom structure be designed in the Adirondack Style. 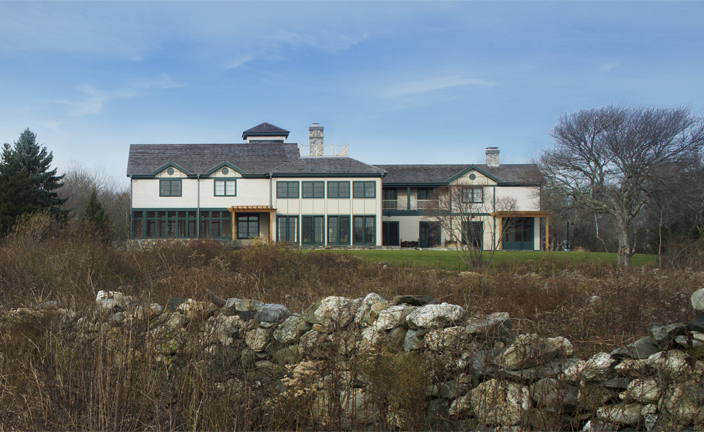 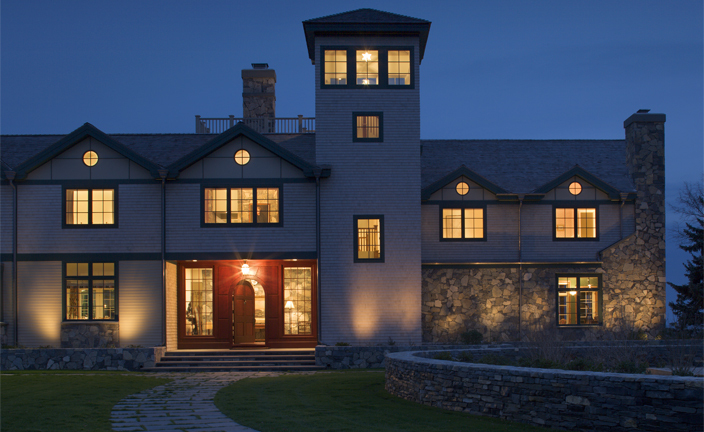 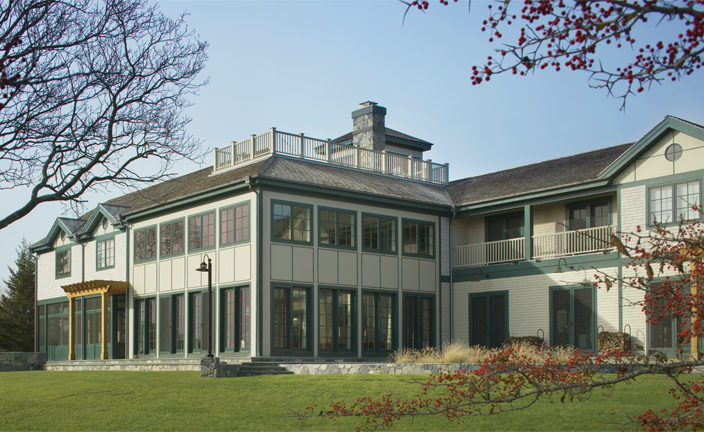 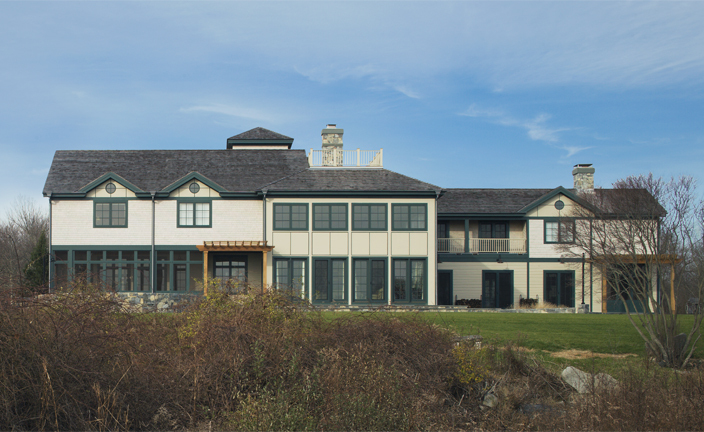 The use of integrated stone walls, clapboard and shingle sidings, wood shingled roofs, and exposed cross-bracing in the great room create a modern interpretation of the traditional Adirondack style, and are incorporated as elements to unify the grouping of buildings. 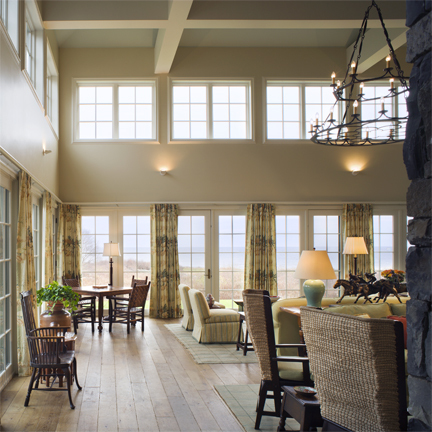 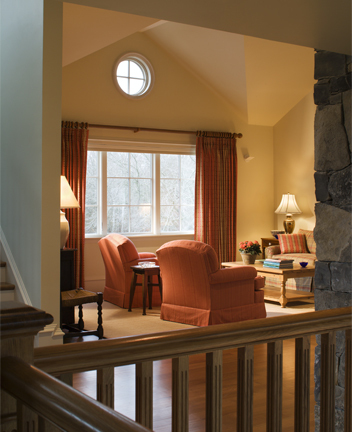 The organizing element of the guest house is a two story great room with continuous 8-foot windows wrapping around the space to take advantage of stellar bay views. 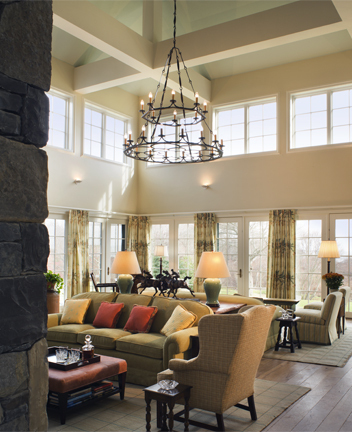 With a line of large clerestory windows admitting even more light, the room evokes the feeling of an indoor “veranda.” Surrounding the great room is the entry hall, a combination kitchen/eating area/sitting room, a study, and a 2nd floor balcony servicing four bedroom suites. 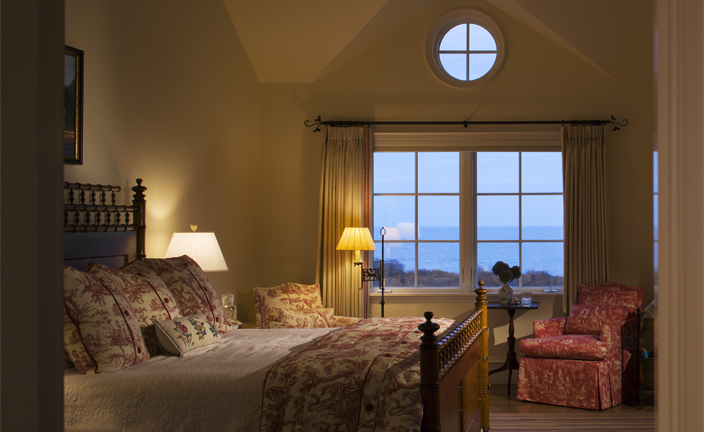 Guest bedroom suites with bay views, keyhole windows and dormer ceilings adjoin a wide hallway balcony looking back down onto the great room. 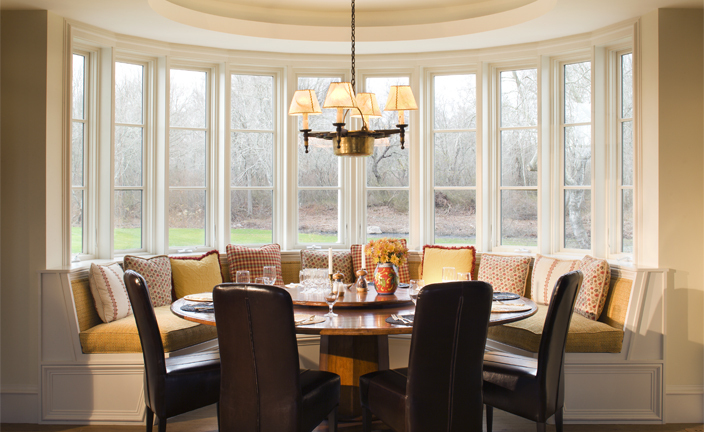 The open plan design promotes ease of circulation and integration of outdoor spaces as extensions of the house. 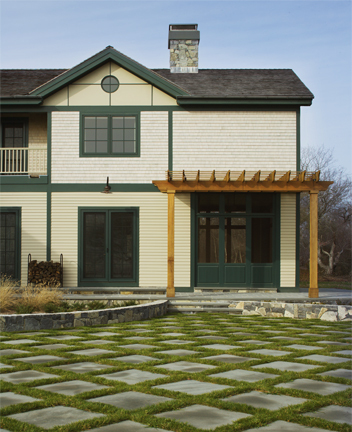 Outdoor features such as the rooftop lookout and grass terrace help to accommodate large gatherings, and the incorporation of various stone walls anchor the house in its environment, echoing lines of existing old stone walls nearby. 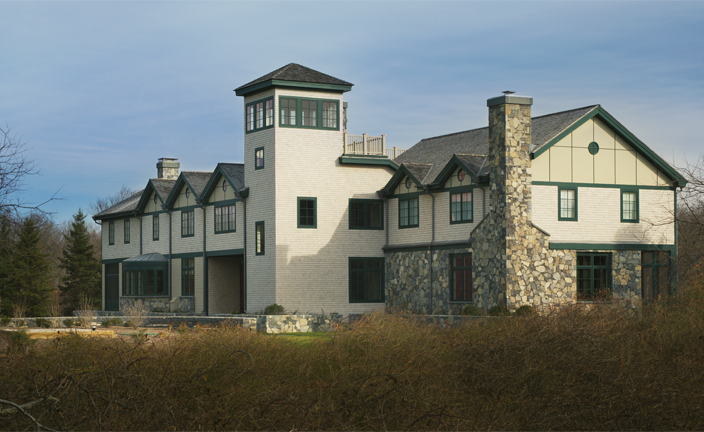 The prominent lookout tower also implies another iconic new England image-the lighthouse, a parallel which is magnified at night, with the bay in view.